The magnets on top of microwave cover, remove the need for extra storage space, compared to standard plastic microwave lids. While you are not using it, just hang it to the roof of your microwave by magnets. It is always on your sight and it will not get in your way when you are placing your food. You will love the convenience! Our microwave cover dishwasher safe is easy to clean with just soap or water or top rack in a dishwasher. The microwave dish cover is high enough to not touch your food. The microwave cover with handle is easy to lift in and out of the microwave oven and is a must-have for cookware for microwaves. 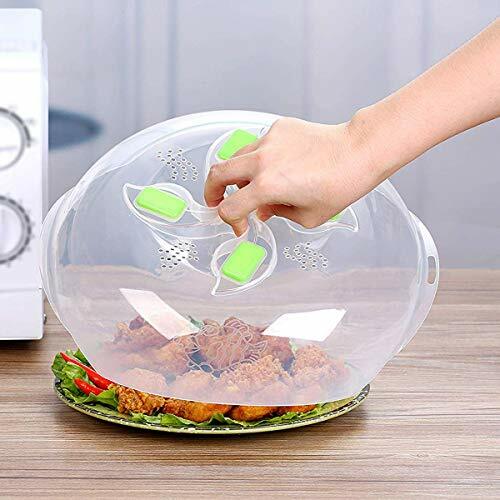 Our microwave splash cover comes with vented top to open to release steam and close to keep food warm. Thank you very much for choosing us ⚠Maximum allowable working temperature: 300℉(150℃)⚠ The material is microwave-safe, food-safe, PBA-free. Keep your microwave clean.The Steam vents can prevent the liquid from splattering anywhere, It fits most dishes, plates, bowls. Specification: Size: 11.5x11.5x3.34 inch Weight: 0.35 lb Your satisfaction is our greatest pursuit! We will ensure the shopping experience for every customer. Thank you very much for your support!